Mobile technology has changed everything by putting the world at all our fingertips. The way we expect to interact with information has evolved dramatically. And because they are essentially a real-time interface for the sharing of information between organizations and their customers, call centers need to evolve too. To that effect, Compare Business Products, an organization that “provides comprehensive and objective business product information to buyers at small, medium and large enterprises” has released a white paper describing how mobile technology can modernize the way call centers operate. In the paper, the authors say it’s critical that call centers develop a strategic approach to handling communications to and from mobile devices in order to stay current. Here’s a snapshot of the strategies call centers are using to stay modern in the mobile world of today and tomorrow. Desks and those plastic floor guards under your wheelie chair are so 1997. Mobile technology is increasingly allowing individuals to work from anywhere, that includes contact center employees. The global accessibility mobile devices deliver frees call centers to employ agents working from home all over the world. The traditional brick and mortar has gone digital. A call center agent’s desk is now a virtual environment they login to at the beginning of a shift. That means infrastructure costs are greatly diminished and call center capacity is instantly scalable as soon as you can hire the staff and connect them to a virtual seat through apps like those offered by companies like Calltaclar and Five9. According to the white paper, “Mobile applications are one area that can have a considerable impact on contact centers.” And applications are already changing the way customers contact call centers from the outside in. Apps like FastCustomer are waiting on hold for people who need to get in touch with customer service. Apparently, almost 80% of smartphone users already use mobile apps to interact with customer service departments more conveniently. Through apps, customers can get account updates, engage in interactive chat with contact centers, and manage their billing. Call centers and customer service departments can be proactive by releasing apps that allow customers greater opportunities for self-service. And when more customers are able to serve themselves, fewer customer contacts are made through the contact center. Some apps allow rapid connection between the customer using the application and a contact center agent. It’s now easy to include a smart button in your mobile application that allows customers to hit that button to get help from a CSR through voice, SMS, instant messenger or chat. There’s even an app, called Helpshift, that offers in app support for other apps. Plus, apps like Desk keep you in the know about your customer service performance as you’re on the move, by providing support updates to your mobile phone. Over 50% of adults in the US own smartphones. And smartphones are able to access the geographic coordinates of the customer calling your contact center. The paper says, “With GPS technology embedded into telephones, contact center agents can easily locate customers and point them in the right direction” when it comes to offering help with locating business locations. People like texting. The messaging platform WhatsApp carries over 53 Billion messages a day all on it’s own. Texting is a fast, easy, and cheap way to deliver succinct messages related to typical requests call centers receive like balance notifications, delivery updates, and transaction status. And the best part is, although some CSRs are taking on the responsibility of sending text notifications, text messages can be automatically sent from a robot. 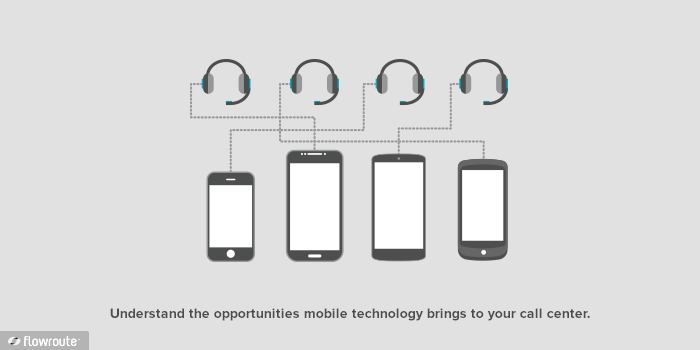 The opportunities mobile technology brings to your call center streamline operations to reduce costs and limit the amount of time customers need to interact with you to get what they need. It’s a win win for everyone. Read the white paper, build your mobile strategy, and prosper.